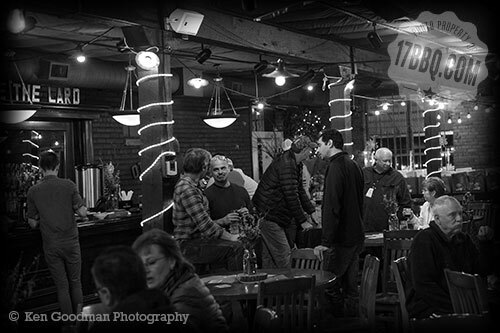 January and February are busy months for booking The Warehouse for weddings, reunions, fundraisers, and all sorts of celebrations. 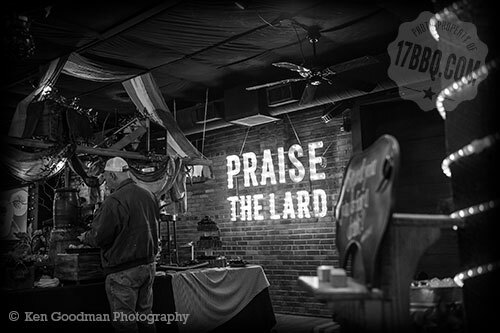 This is also where we hold our OnCue Consulting seminars, and Ken Goodman beautifully captured some details from our recent Whole Hog Extravaganza. Exposed brick walls and duct work with touches of warm wood and lots of twinkling lights make the room feel festive and welcoming. Showstopper. The table is designed with red ticking and solid tablecloths layered over black with a built-up display of natural wood, vintage items, and fresh flowers and greenery. An antique ladder, draped with tea-stained bunting, antlers, and greenery finished off this stunning display. You can rent a huge variety of decorative items from our extensive prop room. 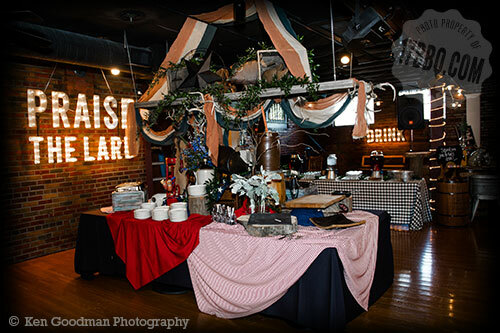 Becky Streuter, our catering manager, has quite the eye for collecting unusual pieces that will elevate your event and make it extra special. 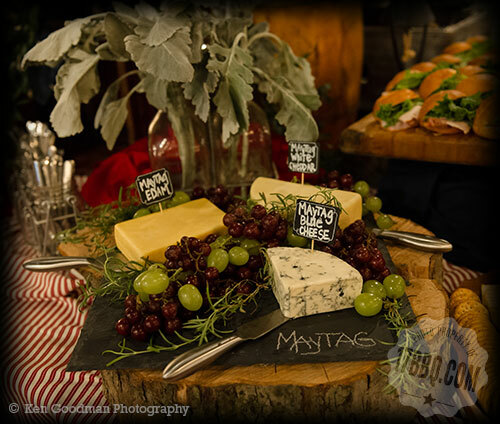 Cheeseboard with specialty selections and fresh fruit. 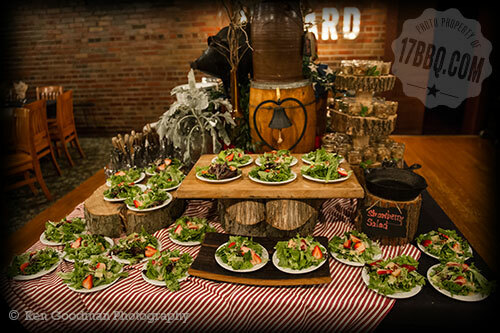 Serving trays made from slices of wood and whiskey barrel staves. 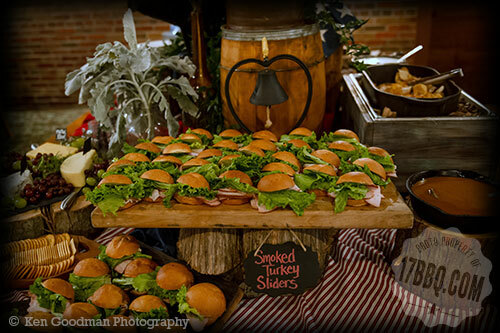 Smoked turkey sliders beautifully displayed on a cutting board, elevated by slices of wood. The large-scale lighted signs are removed for events that might not have a barbecue theme. 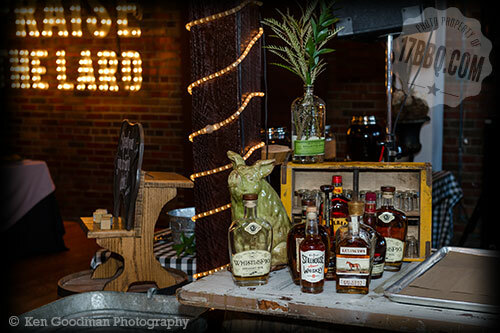 Bulleit bottles repurposed as vases and shot glasses displayed in an upended wooden crate. Libations station. 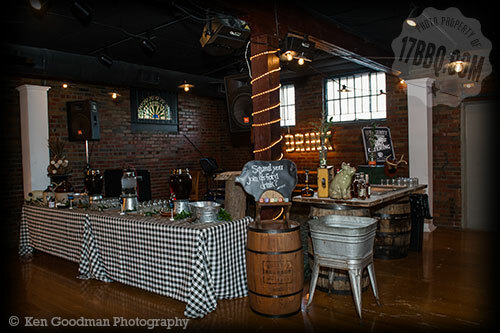 The bar area is constructed of whiskey barrels topped with an old door. Layers add interest. 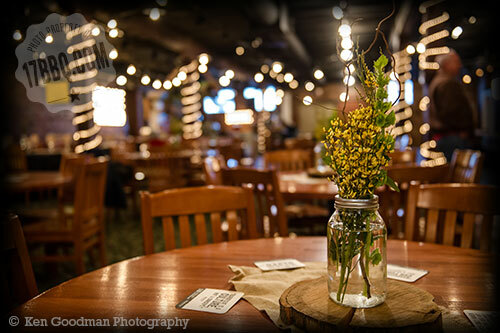 Burlap, wood slices, and fresh flowers in mason jars make simple, attractive centerpieces. 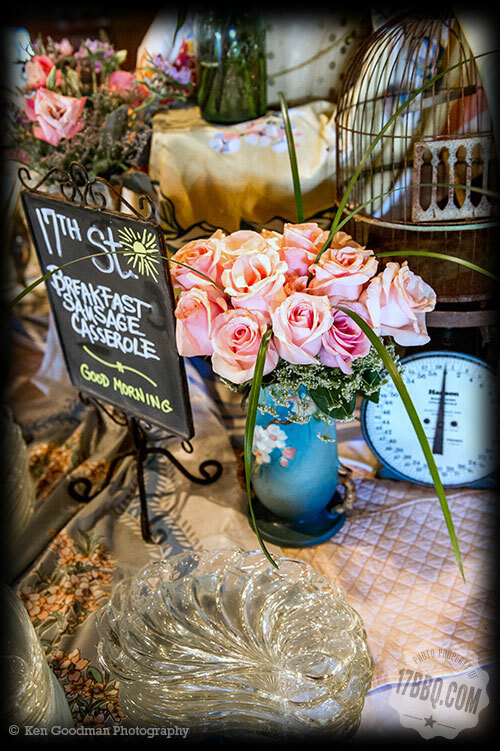 Beautiful breakfast display. 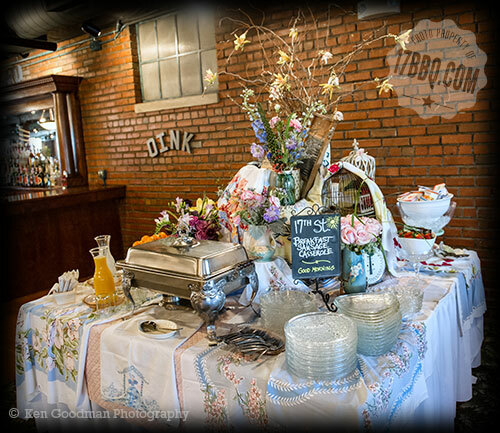 Inventive use of heirlooms, antiques, and fresh flowers. Vintage details. 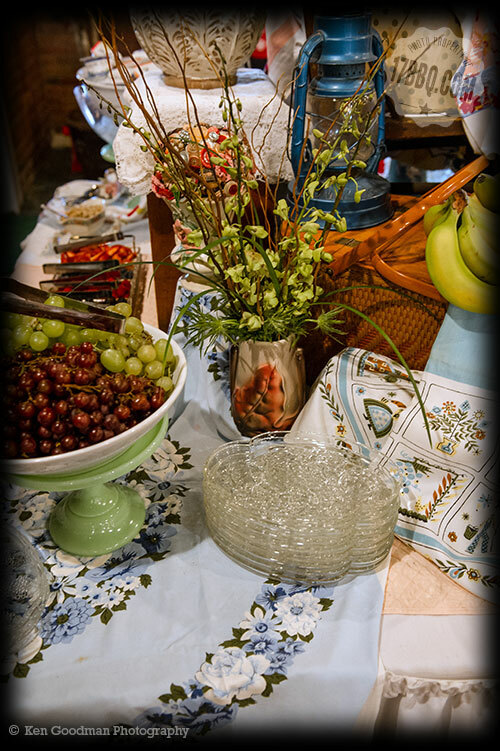 Cut glass plates, jadeite cake stands, and layered vintage linens. Fresh flowers from Twig in the Murdale Shopping Center. 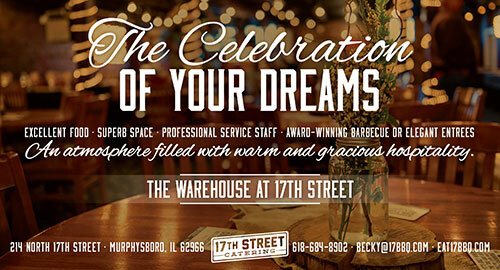 Call 618-684-8902 to schedule an appointment to see our event spaces and plan your party! We’ve gathered lots of ideas on our Pinterest page to help you plan a beautiful celebration. 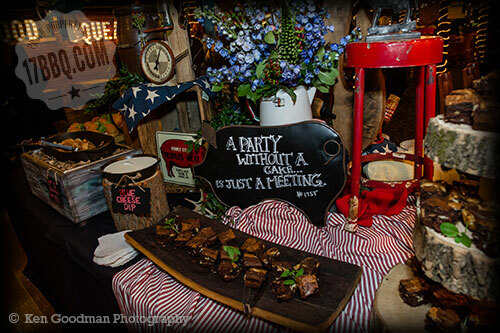 Hogs for the Cause is a barbecue and music event that raises money to provide aid and relief of those variable expenses and economic burdens families face while their child is being treated for pediatric brain cancer. In addition to cooking at the event, we’re committed to raising a minimum of $2,000 to contribute to this worthy organization. 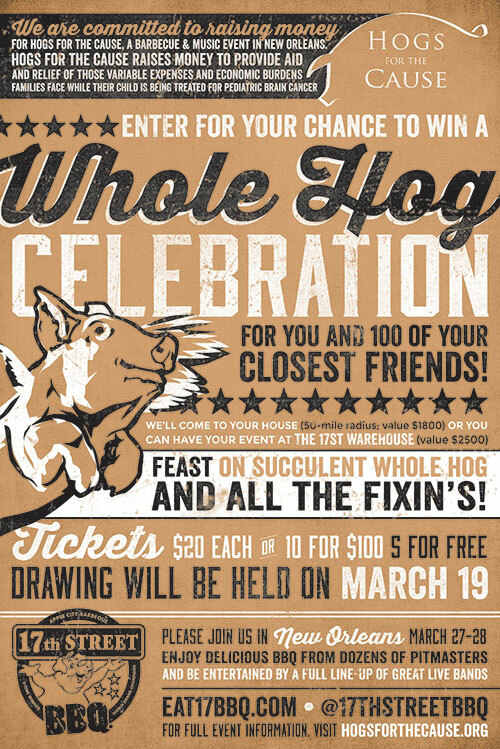 If you’re local, kindly consider buying some raffle tickets for a Whole Hog Celebration. 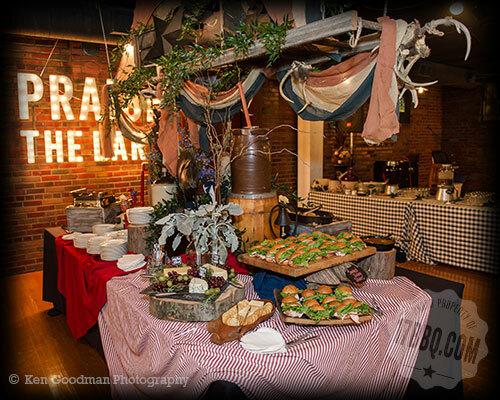 We’ll feed you and 100 of your closest friends. It’ll be awesome. 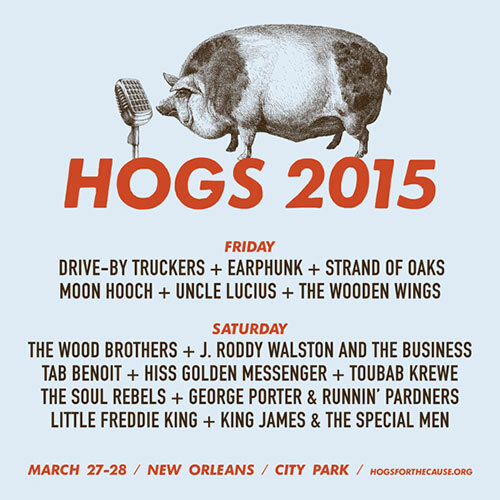 If you live near New Orleans, come and join us at the event at City Park on March 27–28. You can buy barbecue from dozens of top teams and listen to great music. Get your advance tickets here. If you know a family who’d benefit from the good works of Hogs for a Cause, please pass along the grant application information on this page. Hogs for the Cause is a 501(3)(c) organization, so your donations are tax deductible for the full amount as allowed by the IRS.